Since one of the first ever Bitcoin gaming sites, Primedice, was introduced in 2013, the industry has slowly built to a large market of Bitcoin related transactions. Primedice was the first to launch a site, and although it is only a dice game, is still the most popular place players play at with Bitcoin. The site has gone through three different phases: Primedice, Primedice 2, and Primedice 3, with nearly 3 billion rolls through December 2014. While it may seem a bit underwhelming for a player to play at a site that only features one game, it is continually praised by players as one of the most enjoyable games involving Bitcoin. With a strong user base, and more players visiting regularly, Primedice may not only be the first, but also be the last Bitcoin gaming site to be online. As mentioned prior, Primedice only offers one game and that, as appropriately titled, is a dice game. Every roll lands from 0-100 going two decimal places, to the hundredth (44.93), and the object of the game is to predict whether it will be higher or lower than the number given, before the roll. A player has the ability to place extremely high or low odds, on the upcoming roll, from a .01% chance all the way to a 98% chance. The payouts are tiered accordingly, with a slight house edge included. Players can win a maximum of up to 40BTC, per roll, no matter the chance of winning. Although it is not highly recommended a player wager ~3900BTC on a 98% chance, technically, Primedice offers the highest threshold a player can wager, within the Bitcoin gaming realm. The game is automatically set to 2X payout, on log in, and as a new player might be confused as to the win chance only being 49.5% instead of 50, that is where the house edge comes in. So for that example, a player can choose the outcome of the roll being under 49.50 or over 50.49. If a player places a 1BTC and successfully predicts the outcome, then they are paid even money, on the wager. Players have the option of either choosing the number they want to roll over or under by either win chance % or payout, depending on their preference. While most players tend to use the main dice game, there is also a player vs player option to the game. Players can challenge other players to an agreed upon wager, and whoever rolled the higher number, would win the bet, without any house edge included. Although it is not anywhere near as popular as the main game itself, it does provide a change of pace and is fun if a player has friends who are online at the same time. The game also provides a couple unique features, if players desire to utilize them. For starters, Primedice has implemented an auto-roll dynamic that allows players to set a specific number of rolls, wager amount, win % chance/payout, and increase bet % on win/return to base bet. This tool allows players to continue rolling, without having to hit the roll button every single time. Players tend to mostly use this feature when they are trying to profit from the “Martingale System”. (While not going into too much about the Martingale System, it should be highly noted that it should be used with extreme caution, and a large bankroll). The second feature that Primedice offers its players, is a highly interactive chat that players can use for a few different things. Obviously, players can use the chat to chat with other players, but they can also use the chat to “tip” other players. “Tipping” is basically the equivalent of giving another player BTC for any reason the tipping player desires. 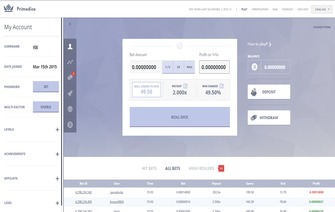 Primedice implements a one confirmation deposit hold, on incoming deposits. Withdrawals are usually instant, unless it is a new account, in which case, it may take up to 30 minutes for the withdrawal to be processed. Primedice offers players a Bitcoin faucet to use, if their account balance is completely nothing. The faucet starts off at 500 satoshi, but can go all the way up to 10,000 satoshi, depending on how frequent and how much Bitcoin a player wagers with. With a decent amount of lucky rolls, a player can manage to build up a nice bankroll, just using the faucet balance. (We turned our 500 satoshi, into .075BTC after a few dozen unsuccessful attempts at the very beginning.) Although this can only be redeemed every three minutes, it is still quite a nice offer that anyone can get. Admittedly, Primedice does admit to directly having a slow player support service, when it comes to communicating with an actual administrator of the site. If support is needed though, it can usually be resolved, within the player chat. Most of the problems that require support are deposit or withdrawal related, and tends to be a site-wide problem. Although these problems are rare, Primedice has done a great job, in the past, dealing with these issues as soon as possible. Very rarely is it a single player who is having an issue, but in those extreme cases, emails can take up to 24 hours to be responded to. Primedice utilizes the “provably fair” system for every roll of the dice. A player can check any bet they have placed, against the verification, and see firsthand, that it will confirm a win or loss. As it is the standard for Bitcoin gaming, it is also the only verification that could be used with a site’s popularity and transaction rate as high as Primedice’s are. Primedice has been around from the very beginning of Bitcoin, and has performed well enough to be considered a top place to wager Bitcoin at. Although it is only one game, it is the #1 most visited Bitcoin gaming site, and will probably stay that way for a long time to come. Bonus Use the faucet balance and turn satoshi to bitcoins!